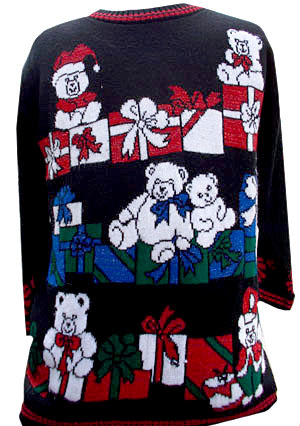 Home > Items just added 4/3-4/17 > (mens Roomy M) Ugly Christmas sweater! Soft! Teddy Bears and Glittery Gifts. Super soft and cuddly Ugly Christmas sweater! Teddy bears and gifts- does it really get much better? Black with white teddies, and glittery red and blue gifts, with red, blue, and green bows. Kind of stark coloring for a cuddly Xmas sweater... Back is solid. Glittery red bows on the sleeves. Made by Holiday Time. 100% acrylic. Sleeves: 25.5" collar to cuff. think of them as 3/4 sleeve.